The Michael King Smith Research Library contains more than 5,400 published aviation-related books and a large and varied collection of aviation magazines. The Library’s collection is open to both researchers and the general public. The Library, located within the Hiller Aviation Museum, is open Tuesday through Friday from 10 AM to 3 PM and on select Saturdays (call the Library to confirm weekend availability). Library entry is included with Museum admission. If you are unable to visit the Museum during its open hours, ask for a ‘rain check’ and come back when you can. Titles in the Library’s collection include both technical works and aviation-related fiction and nonfiction books. If you have a research request,contact the Research Team via email at library@hiller.org or in writing. Please note that the Library cannot undertake research requests for commercial purposes. If you make an appointment in advance, we can prepare some materials for your visit. The collection does not circulate. Photocopies of text are available for 10 cents a sheet, payable at the time you receive the copies. The San Mateo County Bookmobile visits the Hiller Aviation Museum on the second and fourth Wednesday of the month from 11 AM to 2 PM. 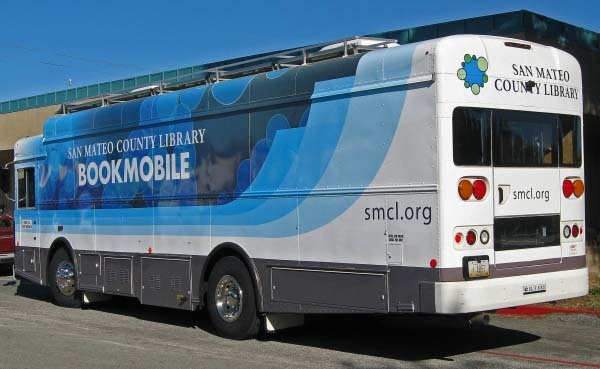 Bookmobile visitors may peruse its traveling collection of more than 3,000 titles, check out or return books, and even request a library card for the San Mateo County Library. Books checked out from the Bookmobile may be returned to the Bookmobile or to any branch of the San Mateo County Library. Gourmet Food Trucks are available during all Bookmobile visits.